Decapitating zombies has never been so easy. This 15 inch overall dagger is more than the average survival weapon. 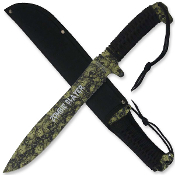 Take the Zombie Slayer knife with you no matter what the occasion. Whether you're killing the undead or just exploring an old zombie nest, this 440 stainless steel Falcon made piece is always ready to rise to the challenge. The razor sharp edge sports a half-serrated section while the top of the blade features rigid teeth for extra carnage when ripping it out of zombie flesh. The handle is wrapped in black paracord just in case you need to untie it and choke one of the living dead out and also features lanyard loops at the end for an added neck knife feature. Includes sturdy nylon belt sheath.